Please click on the question to expand the answer panel. Why do we need to renovate and expand the library? Hopkinton Public Library was built in 1895. In 1967, the Library was expanded by acquiring and connecting the adjacent Episcopal Church (built in 1898). The expansion in 1967 was the last time the building was renovated. At the time, Hopkinton’s population was 5,659 residents. Today, the 19th century library building cannot meet the needs of Hopkinton’s population of over 15,000 residents. The 19th century building cannot adapt to technological advances without major improvements to its infrastructure. The building and its systems are outdated, inefficient and will require more maintenance in the coming years, at a cost to taxpayers. More importantly, the building cannot adequately serve the residents of Hopkinton. The building is simply too small to provide the needed space for patron demand for digital and print collections, public access computers for working or research, areas for working, reading, studying, tutoring or other meetings, and for educational and informational programs. Last, the building is not ADA compliant. The plan for the new building addresses all needed capital repairs to the original building, creates a functional library with adequate space to accommodate increased usage and changing collections, brings the library into ADA compliance, and includes a dedicated library parking lot. Why do we need a public library in the digital age? In fiscal year 2008, Hopkinton library users borrowed 107,024 items from the library. That number increased by 26% to 144,358 items borrowed in fiscal year 2012. This figure includes electronic resources and web renewals. Patrons are using the library to borrow items from other libraries as well, borrowing 14,521 items from other libraries in 2012. In 2012, there were 62,634 visits to the library. Between 2008 and 2012, totaled registered library borrowers increased by 1,131 (from 7,480 to 8,611 registered borrowers). More than half of our Town’s population of 15,000 hold library cards. From fiscal year 2008 to fiscal year 2012, the number of people attending library programs increased by 82%. In the limited space available, the library offered 132 total programs in fiscal year 2011; 142 programs in fiscal year 2010; 154 programs in fiscal year 2009; 165 programs in fiscal year 2008; and 107 programs in fiscal year 2007. To meet with others for civic or work purposes. On average, less than 0.6% of the municipal budget is used to fund the library. Yet, there are 8,611 active cardholders of all ages in a town of 15,000 people. The library is the first step to literacy. For our youngest patrons, libraries offer story hours, book talks, music programs and reading-related crafts and play to spark the imagination and foster literacy. The Children’s Room serves as a safe and creative space where children learn to love to read, think and explore. The friendly and knowledgeable librarians interact with a child to learn his or her interests and recommend books and other media that will encourage that child to read and love learning. The library serves all ages. The library is a source of guidance, outreach, employment training, and institutional and historical research. For young children, libraries offer storytimes, beginning books, and creative programming. Children find their favorite DVDs, CDs, audiobooks, and more for no cost. Also, children can take advantage of the library’s free or discounted museum passes to many of the state’s premier museums and gardens. Teens, young adults and adults enjoy books, ebooks, magazines, DVDs, CDs and other media on their passions and interests. Everyone can participate in informative and entertaining programs and classes, and use or learn new technology. Book club members find recommendations from knowledgeable librarians, as well as multiple copies of the same book at the same time. Commuters enjoy (what would otherwise be expensive) audiobooks on their way to and from work. The library is a community center. The physical structures and programs encourage social and cultural discourse with friends and strangers. This is true for young children, teens, adults and seniors, and will be more so with the event room in the new library. The library preserves the past. Hopkinton Public Library houses the extensive collection of books, photographs, and maps from Hopkinton’s local history. Digital libraries are great, but they exist, for the most part, because of the local and world treasures safeguarded by brick-and-mortar libraries, which keep them safe and accessible for future generations. The library is there in a crisis. After Hopkinton residents lost power for days or weeks in recent storms, Hopkinton Public Library provided a public space with electricity and access to the internet. Libraries belong to their communities and respond in times of need. Librarians provide personalized service. Librarians get to know their patrons and offer service personalized to that patron. Librarians make recommendations on reading materials, help with research projects, teach patrons how to download ebooks and use e-readers, and many more services. From fiscal years 2007 to 2011, reference transactions increased by 73%. Libraries help people use the internet. The library works WITH the internet to bring patrons information, providing internet access for those who cannot afford it and providing research assistance to patrons who need technological assistance or help formulating searches or choosing keywords properly. …And libraries help people use the internet better. Accessing the internet is easy. Accessing the full depth of the internet is difficult. Librarians teach people better search techniques, how to search the “deep web” (where commercial search engines can’t go), and how to evaluate good and bad internet resources. click here for numerous reports, studies and news articles. How was the library project planned? The planning process for the library expansion project began more than ten years ago. In 2001, the Library Board of Trustees purchased the adjacent lot at 9 Church Street to allow for the expansion of the library at its original location in downtown Hopkinton. Since then, approximately $110, 000 of donated funds have been invested to retain a library consultant, architect, and project manager to assist in the application process for a library construction grant. In 2008, the Hopkinton Library Board of Trustees engaged Marjorie Judd, Library Consultant, to prepare the Hopkinton Public Library Building Program. Community input was a significant factor in preparation of Hopkinton’s Library Building Program. To gather input for the Library Building Program, the Library Consultant gathered input from a collection of sources. First, she interviewed the Library Director and Staff. Next, she conducted two public forums organized by the Trustees. Third, she met with community leaders. Finally, the Library Consultant and Library Director created a community survey. An overwhelming response was received to the community survey: 468 adults and 600 students returned surveys. The Library Consultant analyzed the comments and feedback offered by residents, and used all the data collected to create the Library Building Program. In 2010-2011, the Hopkinton Permanent Building Committee and Johnson Roberts Architects used the Library Building Program as the guide for planning and design of the new library. In particular, the design of the new library addresses the four areas of greatest need, as well as other areas of deficiency that exist in the current library. What is the plan for the restoration, renovation and expansion of the library? The proposed restoration, renovation and expansion of Hopkinton Public Library will provide a modern facility that meets the current and future needs of the community, while preserving and highlighting the architectural features of the beloved original 1895 building and the Episcopal Church added in 1967. In 2011, the total cost of the renovation and expansion was projected to be $10.2 million, and included escalation and project contingency costs until 2014. With the addition of escalation and project contingency costs until 2016 (the projected opening date of the new library), the cost is now estimated to be $11.75 million. With the state Library Construction Grant of $4.5 million and private fundraising expected to raise $1 million, the cost to the Town will be reduced to $6.25 million. The $11.7 million total costs includes all construction and contingency costs to cover the issues inherent in renovating and adding to a historic building, including all fees, expenses, utility charges, furniture, computers, project management, temporary relocation, moving of books. It also includes 5 years of escalation costs from the original estimate to cover the anticipated construction schedule of 2015 to 2016. How much is Hopkinton’s state library construction grant? In July 2011, the Massachusetts Board of Library Commissioners (MBLC) awarded Hopkinton a library provisional construction grant of $4,533,580 million. On August 7, 2014, the MBLC awarded Hopkinton Public Library its $4.5 million grant for the renovation and expansion of our Library. Funding for this grant was made possible through the capital bond bill signed by Governor Deval Patrick on August 5, 2014. Click here to read the Press Release from the MBLC announcing the award. What is the Town’s cost? In January 2012, the Hopkinton Public Library Foundation (HPLF) announced that it would spearhead efforts to raise private funds for the expansion and state-of-the-art renovation of Hopkinton Public Library. Since then, HPLF has been working diligently to raise money through gifts from individuals, families, foundations, corporations, small businesses, civic and social groups, and special events. HPLF has held numerous events, such as the Mother-Daughter Princess Tea, Touch-a-Truck, Pink Pint Night, Hoptoberfest, Library Mini Golf and the Heritage Quilt Project, raising money and awareness of the library building project. 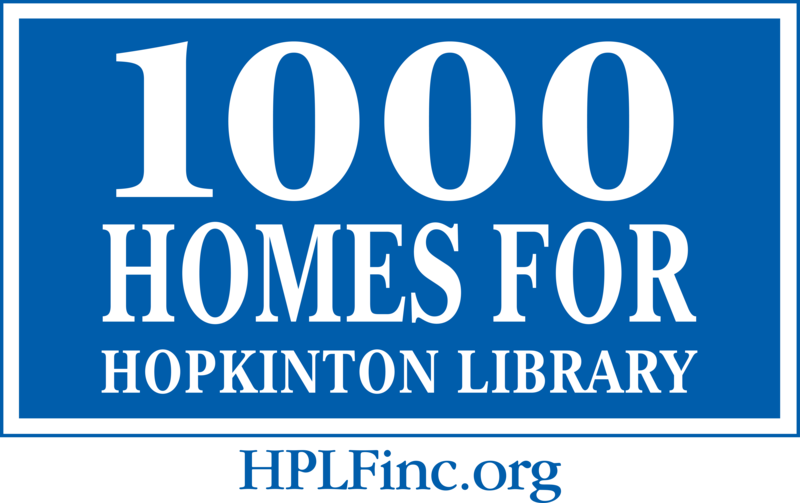 In 2013, HPLF launched its 1000 Homes for Hopkinton Library challenge with a goal of raising $1 million for the renovation and expansion of Hopkinton Public Library. With $1 million in private gifts and the state construction grant of $4.5 million, the Town’s cost of a 21st Century Library for Hopkinton will be $6.25 million. What is my cost, or the tax impact on residents? The initial cost is approximately $95 per year in taxes per average household (valued at $484,360 in FY2014), starting no earlier than FY 2017 for 20 years. The amount will go down each year over the 20 year period as the town pays back principal on the bond. How does the library’s operating budget compare to the Town’s overall budget? The town’s contribution to the library budget in FY 2012 was $341,882 (salaries, supplies, books, telephone, cleaning, and conferences/education), plus $13,540 (oil and gas utilities), for a total of $355,422. This amount represents about .57% of Hopkinton’s entire budget of approximately $62,276,837 for FY 2012. Generally, the library requests approximately 2.5% annual increases in its annual budget. Why do the plans call for the library to stay on the current site instead of moving somewhere else? Built in 1895, the library has been an icon of downtown Hopkinton for generations. With an expansion along Church Street, the library will continue to be the anchor and focal point of downtown Hopkinton, and will serve the community for generations to come. New construction on a vacant, 4-acre parcel of Town-owned land at 0 Claflin Place. This site is a vacant, town-owned parcel consisting of approximately 4 acres. It is located behind a house at the end of a dead-end residential street, Claflin Place. There are no buildings of a municipal, civic, or religious nature in the immediate vicinity of Claflin Place. To obtain access to the site, the Town would be required to take land containing a private home in the residential street. In addition, the lot contained minimal buildable area because of the presence of wetlands. For these reasons, the site was not considered feasible. 11 Ash Street, currently being used as Center Elementary School. In March 2011 (STM), residents did not approve funding for a new school to replace Center School, and consequently the site is not available for use as a Library. At public meetings in the Fall of 2010, members of the community expressed strong preference for a centrally located library. In addition, residents that attended the public meeting overwhelming expressed support for the current location – the site of Hopkinton Public Library for over 118 years. In these meetings, residents expressed the sentiment that the existing library building has both historic and symbolic value to the community, and that keeping the library at the heart of downtown is important. Residents also felt that renovation/expansion of the current library provides the highest visibility and recognition for the community. Ultimately the site of the current Library at 13 Main Street (expanded to include 9 Church Street) was selected because it provides sufficient land to construct a Library that meets the needs of the Library Building Program, while maintaining the prominent and historic location in Downtown Hopkinton. How does the plan address the lack of parking at the library? The proposed site plan includes 21 parking spaces in a parking lot directly adjacent to the library and accessible from Church Street. Hopkinton’s own by-law regarding parking in the Downtown Business District governs the amount of parking that will be required. Under Hopkinton’s Business District by-law, the expanded library will be expected to provide about 55 parking spaces. To meet the requirements of Hopkinton’s Zoning by-law for the Downtown Business District, Hopkinton must develop plans for additional parking for library patrons. Town officials have been working on various possibilities to provide additional parking for library patrons, including shared parking in existing lots in the vicinity of the library. All current parking locations downtown will continue to provide access. Over 100 spaces currently exist within 500 feet of the library. Larger events will be off hours so as not to compete with mid-day access to parking. Since 2009, 4 downtown businesses have requested a “Special Permit”, or asked to be allowed to operate with less than the required number of downtown parking spaces, and all of those requests have been approved. What is the reason for the size of the new library? Why is the current building size insufficient? The current building does not meet the current or future needs of Hopkinton’s continually increasing population or accommodate continuing evolution of technology. The last renovation of the library was in 1967 when the population was about 5,659 residents. The renovation in 1967 brought the building to its current size of 5,783 square feet. Since then, the population has tripled and the need for library services has dramatically increased, yet the library size has remained unchanged. The expanded building – consisting of 22,000 square feet on two floors (25,492 including basement space) – will accommodate Hopkinton’s current population of 15,000 residents, as well as its expected population of over 20,000 residents in 20 years. Based on those needs, along with Hopkinton’s current population of 15,000 and projected population of 20,000 by about 2030, the Library Building Consultant recommended a library with approximately 27,000 square feet. In 2010-2011, community residents express strong preference for maintaining Hopkinton Library in its current location, and expanding and renovating the historic building to meet the needs of the community. To meet the requirements of the lot and local zoning, the building was downsized to 22,000. At that time, the PBC worked diligently to plan a library that will serve our community based on current and projected populations and program needs, adapt to current technology needs, be a ‘green’ building as LEED silver, and serve the community for generations to come. The proposed 22,000 square foot building will accommodate Hopkinton’s current population of 15,000 residents, as well as its population in 20 years, which is expected to be 20,000 residents. The existing building is about 5,783 square feet – one of the smallest libraries for a community of this size. The last renovation of the library was 43 years ago, in 1967, when the population was about 5,000 residents. Since then the population has tripled and the need for library services has dramatically increased, yet the library size has remained unchanged. The level of the community investment required for any building project should be based on a plan that projects a long service life of the building. The twenty-year planning horizon is a state requirement. The Massachusetts Public Library Construction Grant Program will not fund any library building that will not serve its community for at least 20 years into the future. This makes sense because our community needs a building that supports changing and growing needs. The size of our new Library is proportionate to the projected increase in Hopkinton’s population. Why don’t we just fix the problems with the current building? Our library is 120 years old. It is one of the most used buildings in Hopkinton and has served the community well for many years. The building, however, is in need of significant maintenance and repairs to keep it in good condition. In September 2012, the Permanent Building Committee estimated that capital repairs to the existing building will cost $1.1 million. However, this figure does not include any unforeseen costs of repairing the building, such as deficiencies found under the existing roof or during a structural analysis. In addition, improvements to make the building ADA compliant (accessible restrooms and addition of an elevator) will reduce the net usable space, effectively reducing the size of the building. Last, the repairs and maintenance will only keep the building in good condition; it will not make it more efficient or better equipped for current or future technology. For a comprehensive list of outstanding capital repairs and costs, please see the Permanent Building Committee Report. Why should we do this project now? In 2011, Hopkinton submitted and was approved for a 2010-2011 Public Library Construction Grant. The 2010-2011 Massachusetts Public Library Construction Grant Program (MPLCGP ) offers the highest reimbursement rate to date. What is the MBLC? What is the Massachusetts Public Library Construction Grant Program? What role does the MBLC play in planning and design, as well as construction? The Massachusetts Board of Library Commissioners (MBLC) assists communities in developing their public libraries through the renovation and expansion of existing buildings or the construction of new facilities. The Massachusetts Public Library Construction Grant Program is a grant program administered by the Massachusetts Board of Library Commissioners. Since 1990, the Massachusetts Public Library Construction Program (MPLCP) has awarded grants to more than 200 cities and towns throughout the Commonwealth for construction of new library buildings, addition/renovations, special projects and the preliminary planning activities essential to building projects. In 2011, Hopkinton submitted and was approved for a 2010-2011 Public Library Construction Grant of $4.5 million. The 2010-2011 Massachusetts Public Library Construction Grant Program (MPLCGP ) offers the highest reimbursement rate to date. Since 2008, over $110,000 of non-taxpayer funds has been invested in the planning and design of the new Hopkinton library building. As with all state grants, the MBLC will require the town to adhere to the overall plan submitted to the state for the library construction grant. As such, the size of the library may not decrease substantially (more than 5%). The MBLC may also make recommendations on the design of the building, given its extensive experience of providing funding for library improvements to hundreds of libraries in the state over the last 25 years. What opportunities did the community have to provide input on the library project? Since planning for the library project began, the library staff and a professional library consultant conducted interviews with local officials, library users and residents to identify needs. This group also received over 1,000 surveys prepared by residents and Hopkinton school students to identify library needs. This data, along with other extensive information, was used to develop a library on which the expansion program is based. The Permanent Building Committee (PBC) also held numerous public meetings and forums to review the design concepts and receive input from residents. During the fall of 2010, the PBC held three public forums for residents, two at the Fire Station and one at the Senior Center. One of the three meetings was a joint meeting with the Board of Selectmen. About 100 residents attended these sessions. A number of residents also attended PBC public meetings to provide input. The PBC gave frequent (at least monthly) presentations and updates at Board of Selectmen meetings, which are broadcast live on HCAM and to live audiences. Beginning in the fall of 2010 up to the Annual Town Meeting in May 2011, the PBC made presentations on the Library Project to: Land Use and Planning Departments, the Planning Board, Zoning Advisory Committee, Capital Improvement Committee, Town Department Heads, Public Safety officers (fire/police/DPW), and Hopkinton Chamber of Commerce. Many of these meetings were reported in the local press. In the spring of 2011, The PBC offered two more public information sessions: one was televised live on HCAM and the second was at the Library in a child friendly format. Overall, during 2010-2011, the PBC sought input and feedback from the community on the library plans at 12 public meetings and 20 Information Sessions and presentations to the community and local boards, committees and organizations. The Trustees and Library Department advertised the forums through a variety of sources and the forums were reported in the media and news, including HCAM, HopNews, the Hopkinton Crier and the Hopkinton Independent. What happens after the May 19 vote? What role does the Hopkinton Historic District Commission have? It is the role of the Hopkinton Permanent Building Committee (PBC) to work with the architects and oversee the design, approval and construction processes. All members of the PBC are volunteers with experience in construction. The approval process for this project will be the same as for any public or private building project in Hopkinton. If residents vote at the Town Election to approve the $11.7 million funding for the library project, then the PBC and architects will immediately begin working with local boards and committees to solicit input on a final design that will satisfy the many interests of the town. The local boards and commissions that will have the opportunity to review the plans include: Zoning Board of Appeals, Planning Board, Historic District Commission, Historical Commission, DPW, and Town staff. The community will have numerous additional opportunities for involvement during the approval process. The HDC is one of many local regulatory or permitting boards that will review the final design. No board’s job is to halt a project, but to ensure that each project meets local (and in some cases state) requirements. As objective evaluators, these groups reserve judgment until they see the detailed design that the PBC and the architect present. As a project that is important to the entire community, each board or committee will have the opportunity to work collaboratively with the PBC to help the community produce a final design that serves the best interests of Hopkinton. The application for the library construction grant was filed in January 2011, with news of the provisional award expected as soon as July 2014. The community must approve the local share of the project funding. Once the community votes to approve funding, Hopkinton would next execute an agreement with the MBLC. At that point, Hopkinton would have twelve months for design work and public bidding. Based on this schedule, construction on the library would begin in 2015. Construction is estimated to be completed at the end of 2016. Will the expanded library require additional staff? It is expected that the library renovation and expansion will result in increased use of the library and, therefore, an incremental increase in staffing will be requested over time. Any increase in budget (and, therefore, additional staff and hours) must be approved by Town Meeting. Why does the library need an event room? The plan includes a dedicated presentation space with 110 seats. As part of its mission, Hopkinton Public Library offers special educational programs and events to the public. A designated event room will enable the library to expand its programs and offer them in an appropriate area. From fiscal year 2007 to fiscal year 2011, the number of people attending library programs increased by 304%. In the limited space available, the library offered 182 programs in 2012; 132 total programs in fiscal year 2011; 142 programs in fiscal year 2010; 154 programs in fiscal year 2009; 165 programs in fiscal year 2008; and 107 programs in fiscal year 2007. The library can also make this meeting space available to community organizations after library hours. What is the proposed plan for the vaulted ceiling in the main reading room? The current plan calls for the existing main reading room floor to be lowered to match the floor level of the new library and to have a 2nd floor added to provide space for the technology classroom, an office for staff and restrooms on the second floor. The stained glass window at the front of the building will remain intact, and the ceiling will be modified in that area to maintain the window and make it visible from both floors in the expansion plans. If the main room vaulted ceiling were left intact, the building would lose approximately 1,000 square feet of space on the 2nd floor. Given the history of this room and the added feature of maintaining this vaulted ceiling for the new meeting room, this is a suggestion that PBC will consider and review with the architect. What about competing demands in the community? The public library is one of the few Town institutions serving ALL residents, from infants to senior citizens, six days a week. The library also supports other departments and organizations in town, such as the schools, Senior Center, and regularly collaborates with various civic groups and organizations. In its September 2012 report, the Permanent Building Committee determined that the Library was one of three Town buildings that do not meet the current needs of the community. The other two insufficient buildings are: Center School and the Department of Public Works Facilities. It should be noted that the PBC did not evaluate these buildings for potential future needs as the town grows. The library has a number of capital repair issues (deferred maintenance, building envelope problems, and access issues) that must be addressed now. Further delays will result in higher costs, and loss of private and state support for a solution. The Town has the opportunity to leverage $4.5 million in state funding, plus private donor support, to provide a long term solution for the community – a state-of-the-art library for Hopkinton – rather than use solely Town money to “fix” an inadequate, undersized, and inaccessible building that cannot meet the needs of the Town now, let alone in the future. This necessary project has been delayed for many years to allow other town needs to be addressed. It is time for the library to be addressed. Why not use Hopkinton’s school libraries? The school libraries are not open to the public. They are not staffed to accommodate large numbers of users. Their collections are narrow in focus – intended to serve specific audiences, sometimes only one or two grade levels. They do not have the facilities, the collections, or the staff to deal with the large numbers of users – of all ages – that use public libraries. Furthermore, security in our schools is paramount. The idea of integrating public library service into school libraries is not feasible given the need for safe schools. A basic precept of the public library is that it is open to all. By state law, our public library serves residents of Hopkinton as well as members of other communities. We serve people of all ages and backgrounds. Mixing open public access of the public library with the safety goals of the public school system presents considerable security challenges. What is the potential economic benefit of the library building project? The renovation and expansion of Hopkinton Public Library is an investment in our community’s future. The library has been an integral part of this community for over 100 years. Investing in the library makes a statement about the importance of Hopkinton’s heritage and its commitment to literacy, culture and access to information and education. Across the nation, libraries serve as anchors in their downtowns. A recent study of libraries that built new buildings or renovated existing ones between 1994 and 2004 in Massachusetts found that the number of library visits for services and materials increased by 30 percent once the project was completed. This means 30 percent more people walked, drove or took public transportation to downtown business areas to get to their public library, and this additional traffic helps local businesses. (To read the MBLC’s Building Hope, Public Library Construction in Massachusetts, please click here). The economic development potential of the new library couples with downtown revitalization efforts to attract new, tax-paying residents and businesses to Hopkinton. Across Massachusetts and the nation, library expansions have acted as catalysts for economic growth and community development.